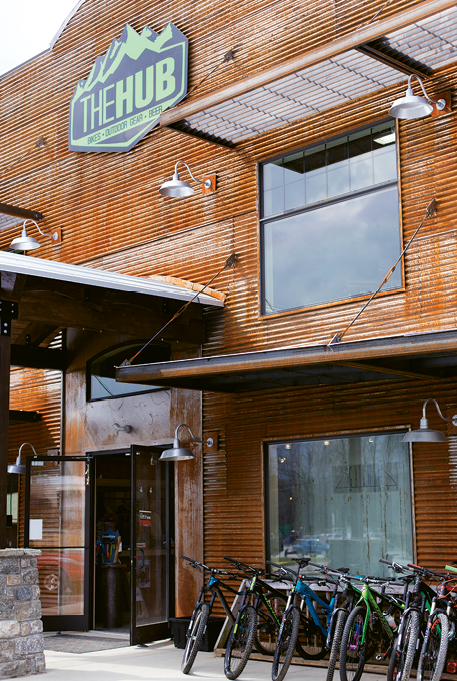 Thanks to Brevard’s reputation as a mountain biking mecca, the nearby unincorporated community of Pisgah Forest is reinventing itself as the beating heart of the local bike and beer scene. Sierra Nevada Brewery is developing a specialty batch of Pinch Flat IPA to commemorate The Hub’s first season in the new shop, and among the other breweries likely to make the menu is The Hub’s new neighbor, Ecusta Taproom, which is slated to open in June. Located just across the street along the Davidson River, the new brewery will produce four flagship beers, best enjoyed on the patio overlooking the river. With the addition of Ecusta Taproom, it, along with Pisgah Tavern and Oskar Blues Brewery, will form something of a pub pedal tour, as all three are easily accessed via the Brevard Greenway. In recent years, Brevard has invested in several similar routes, including the Ecusta Trail—a former railroad bed-turned-18-mile paved pathway between Hendersonville and Pisgah Forest—and Bracken Mountain Preserve, a single-track trail network connecting downtown Brevard with the forest. Bikers and brewers are not the only ones dressing up Pisgah Forest. Davidson River Outfitters is taking up residence in The Hub’s old building in order to expand its fly-fishing operation, and Pilot Cove Campground, slated to open this fall, is creating a premier glamping resort featuring cabins, yurts, an amphitheater, and four miles of mountain biking trails.